Summary: When we first meet Daisy, she’s in a cage at the pound, situated between the door leading to the Good Side, full of sunshine and happiness, and the door that goes to the Bad Side, smelling of fear, from which dogs never return. 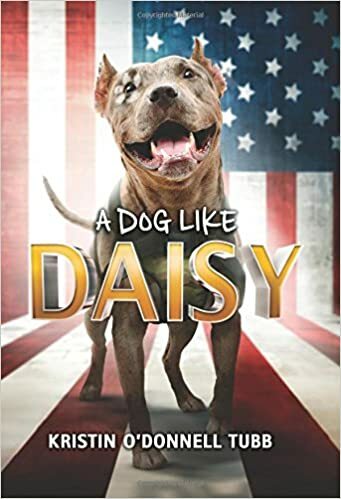 Daisy knows it’s almost her time to go to the Bad Side, but she’s rescued by a military veteran named Victor and his son Micah. Victor suffers from PTSD, and he’s enrolled in a program to train a service dog. The VA will pay for ten weeks of training, so that’s how long Daisy has to prove herself, or get sent back to the pound. But Daisy’s got some trauma in her own past, and sometimes that can interfere with her training. And as much as she wants to help, figuring out humans can sometimes seem impossible. When Daisy fails her first test as a service dog, she’s given a second chance…will she be able to make the most of it? 177 pages; grades 3-7. Pros: A heartwarming story with a very funny canine narrator. Readers who are struggling to get that summer reading requirement taken care of might want to consider this relatively short book that is both compelling and humorous. Cons: The ending seemed a little implausible; however, readers will find it very satisfying.